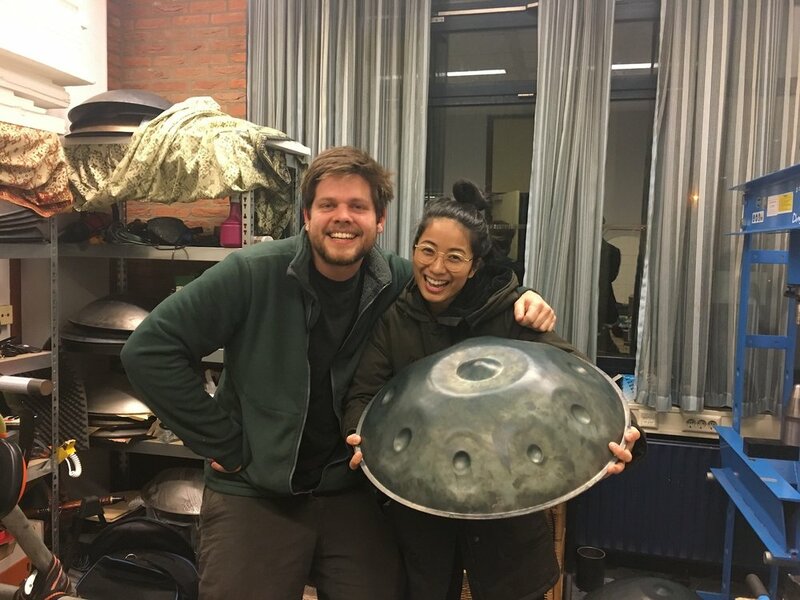 After visiting Gadung handpan maker in Hilversum, next on my list was to visit Godan handpans, made by Dutchman Jesse Smits in Den Haag. One evening, before rehearsal with band Left Alive, I went with Sjoerd (bassist) to visit Jesse and the Godan workshop. Located in the old headquarters of the airforce military defence, the building is home to many creatives, start-ups, music groups, builders, anything goes! First we went up to his music studio, and wow, what a musician's playground it was! Full of instruments and recording gear. There we were accompanied by his girl and we met Marcel from Di-Rect who shares the studio with Jesse. Then we went to the Godan workshop, where Jesse makes his handpans. He has his oven and tools there (and toy remote control car that he plays with when he's waiting for the handpans in the oven). He said that he is part of a European group of handpan makers who have a cooperative and he uses Shellopan shells from France. I got to play some of his exotic scale handpans and in his workshop he even had one with I think 13(?) tones. Jesse loves to experiment and told us he loves to work with musicians who want something different from a handpan, because he gets bored of making the standard ones. He has a "happy" sounding (major scale) handpan for playing between making all the minor scale handpans. Thanks Jesse for a fun tour of where the magic happens!